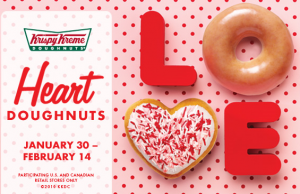 Get twelve FREE Valentine Cards when you purchase a dozen Krisy Kreme doughnuts. Each Valentine card is good for a FREE doughnut of choice for you or for your Valentine. Offer good for one set of twelve cards per dozen purchased. While supplies last. You could give the Valentine's cards to someone you love - or you could just send your sweet love a Krispy Kreme Valentine e-card and keep all the coupons to eat all the free donuts yourself!